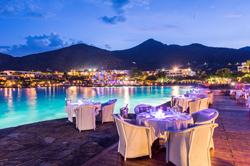 Situated between two picturesque bays on the northeast coast of the Mediterranean Island of Crete, the Elounda Executive Conference Centre, consisting of the two renowned hotels Elounda Beach & Elounda Bay Palace, prides itself on offering both the delegate and organizer a multi-lingual, friendly and efficient service. 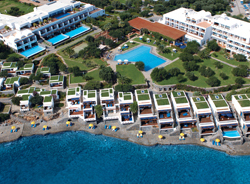 Renovated yearly, the Centre is designed to reflect the traditional architecture of the Cretan Island, providing the finest facilities and also creating the perfect environment for successful and productive events. 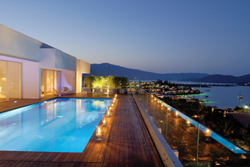 The Centre is situated at 69km - 45 minutes by car - from the International Airport "Nikos Kazantzakis" (in Iraklion). 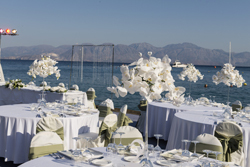 With the conviction that next to the setting and the venue itself, accommodation is one of the key ingredients to a successful event, the management at Elounda places high importance on top quality accommodation during a conference. 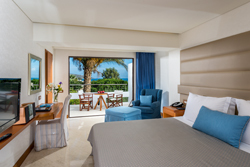 The Centre provides a comprehensive range of accommodation with 510 luxurious rooms, bungalows and suites with a panoramic sea view, some with private heated pool. Each guestroom is - at a minimum - appointed with air conditioning, hairdryer, bath robes, bath amenities, mini bar, Satellite TV, direct-dial phone, fireplace ( some), Jacuzzi ( some) DVD (some), fax modem (some), computer modem ( some) and high speed Internet access. 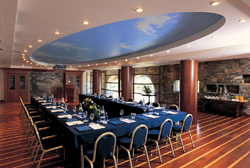 Delegates can rest assured that they will be treated to a first-class dining experience in stunning venues, which serve a wide variety of international and local menus, ranging from fresh and uncomplicated Cretan cuisine to exotic Peruvian & Japanese cuisine and a Sushi Bar. 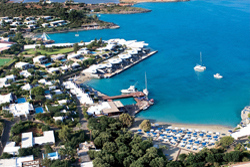 The wealth of on-site facilities include laundry/dry cleaning, barber shop, beauty salon, ESPACE VITALITE CHENOT ELOUNDA BEACH, Wellfit Center, boutiques, car parking, limousine service and helicopter service. Sport and fitness activities available on site include water sports, mini golf, snorkeling and scuba diving. 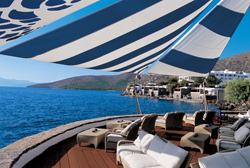 The Centre features specific and individual incentive programmes such as team building activities, water Olympics treasure hunt, fantastic catered or on-site theme dinners, Greek night, BBQ night, fisherman?s night, tailor made Events and excursions, cruises and Jeep Safaris to sites on the island and nearby islets. As expected from a world-class venue, the Centre?s technical, presentation and communication facilities are modern, efficient and adaptable. 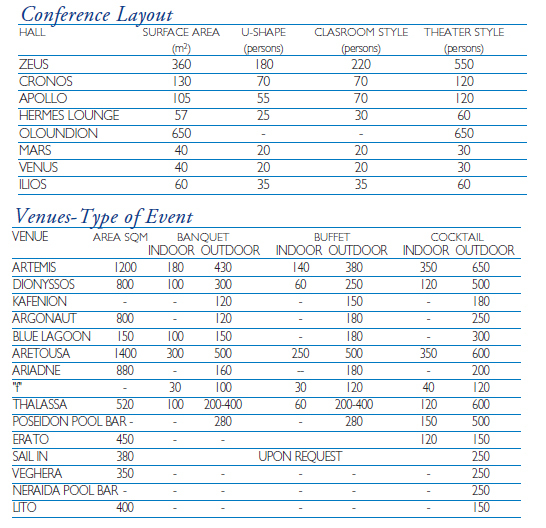 Whether the requirements are for a simple presentation or a spectacular production, the Centre?s technical production team and its suppliers, are superbly equipped to design and implement creative and imaginative solutions, while the event planning team is able to make creative contributions, suggesting ways to turn each event into both a successful and unique experience. The Centre?s state-of-the-art audio-visual equipment includes personal computers, fax, photocopier, tele-conferencing, (rental upon request), high-speed Internet access, screen, overhead projector, slide projector, LCD projector and flipcharts. Secretarial services are also available. Keen on ensuring the smooth and efficient handling of all requirements, the Centre?s expert staff is prepared to offer the perfect level of support and advice and simply make each event exceptional.